After a week devoted to caterpillar fun we naturally progressed into our butterfly theme this week. 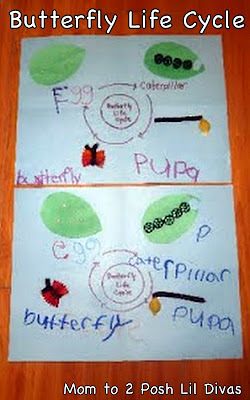 I started the week discussing the Butterfly Life Cycle (which we also touched on last week). There is just no better way to teach this than by observing it first hand. We have had such a wonderful time watching our caterpillars grow, shed, prepare and form their chrysalis and emerge as butterflies right before our eyes! Our fifth and final butterfly emerged from it's chrysalis today - the Lil Divas were beyond excited! I found some butterfly life cycle sequence cards from Preschool Post that we used. 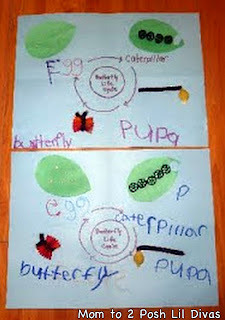 The Lil Divas had to sequence the life cycle (they did great by the way - they told me it was easy, lol!) and then I had them match up the words to the pictures as well (that was trickier). 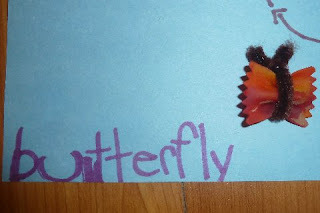 I had an entirely different craft in mind for our study of the Butterfly Life Cycle but my girls were restless, my allergies were raging and Mama was just plain tired to undertake the big craft I had planned on that particular day. Then, I remembered the quick & easy pasta life cycle craft I did with my 2nd graders (I had a class of 30 so quick and easy was essential!). They had enjoyed it and it really helped them recall the different stages. I looked in our cabinets and found that I could make it work! Yay! So, I whipped out the food coloring to make it a bit more festive for the Lil Divas and we set to work coloring some of our pasta in preparation. 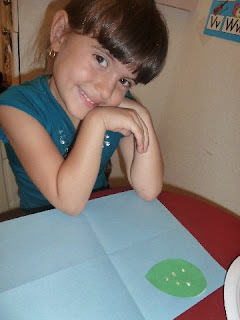 Prep - use the green construction paper to make 2 leaves. We cut a little hole in 1 to make it look like the caterpillar took a bite out of it. 2. Discuss how a caterpillar begins it's life - as an egg. 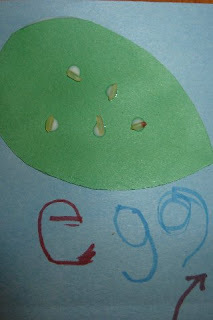 Then in box # 1 add a leaf then glue a few grains of rice (eggs) to it. Add the word egg to label. 3. Discuss what hatches from the egg - a caterpillar & talk about what it does - eats lots of leaves to grow & prepare to become a butterfly. In box #2 add the other leaf (w/cut out) and glue on your wheel pasta to form a caterpillar. 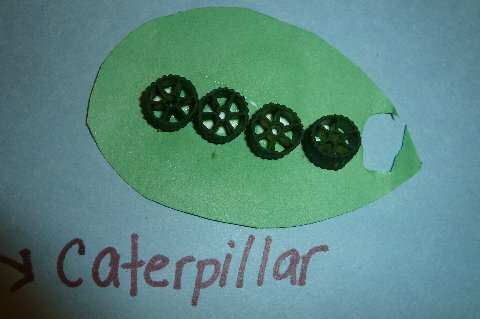 Add the word caterpillar to label. 4. 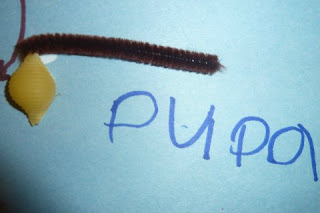 Discuss what happens to a caterpillar after it has eaten & grown - it becomes a pupa/chrysalis. In box # 3 add the pipe cleaner (branch) and glue your shell pasta. This is the pupa or chrysalis - label. 5. Discuss what emerges from the chrysalis - a butterfly. In box #4 add your shell pasta and label with the word - butterfly. Now that you have completed your life cycle let your child use it to explain the life cycle of a butterfly to you! Tis the saeson for life cycle explorations! What life cycle crafts/lessons have you explored with your children? Congratulations on your butterflies! It was so exciting around here when ours all emerged last summer. I love your pasta craft--what a neat way to learn about the stages. such a great idea. love it! 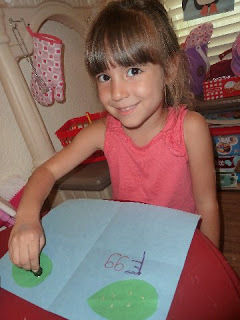 Thanks for sharing on Kids Get Crafty! Love your posts! 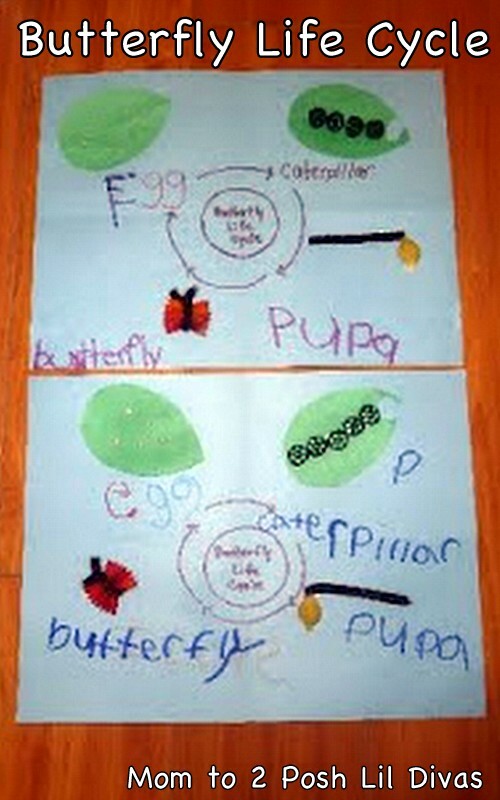 great idea....what a fun and creative way to explain the life cycle of a butterfly! very fun. Nice using what you had and letting your mood help you determine what is best that day for you and your kids. Thanks for sharing at my art party! Hope you come again tomorrow. I have had trouble leaving a comment. It looks like I will finally be able to. Fun projects. Great idea to use pasta to study science!